Eight-year-old Libby has come with her parents to spend a year at the newly established colony on the planet Iago Prime. Libby's parents believe that this is a great opportunity for all of them, but Libby is unhappy on Iago Prime. There are no other children on Iago Prime and Libby can't go anywhere, because she doesn't even have a space suit. Worst of all, they will spend Christmas on Iago Prime, where there aren't even any Christmas trees. 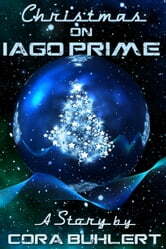 However, Libby's parents, with a little help from Santa Claus himself, conspire to give Libby an unforgettable Christmas on Iago Prime. Three . . . Two . . .One . . . Blastoff!